Shariati, M., A. Farzi, G., Dadrasi, A., Amiri, M., Rashidi Meybodi, R. (2015). An Experimental Study on Toughening Mechanisms of Fillers in Epoxy/ Silica Nanocomposites. International Journal of Nanoscience and Nanotechnology, 11(3), 193-199. M. Shariati; G. A. Farzi; A. Dadrasi; M. Amiri; R. Rashidi Meybodi. "An Experimental Study on Toughening Mechanisms of Fillers in Epoxy/ Silica Nanocomposites". International Journal of Nanoscience and Nanotechnology, 11, 3, 2015, 193-199. Shariati, M., A. Farzi, G., Dadrasi, A., Amiri, M., Rashidi Meybodi, R. (2015). 'An Experimental Study on Toughening Mechanisms of Fillers in Epoxy/ Silica Nanocomposites', International Journal of Nanoscience and Nanotechnology, 11(3), pp. 193-199. Shariati, M., A. Farzi, G., Dadrasi, A., Amiri, M., Rashidi Meybodi, R. An Experimental Study on Toughening Mechanisms of Fillers in Epoxy/ Silica Nanocomposites. 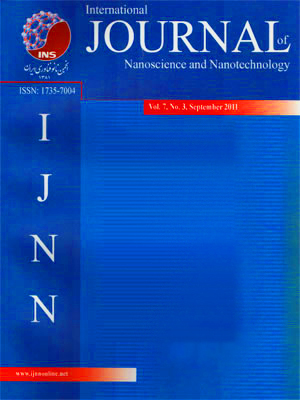 International Journal of Nanoscience and Nanotechnology, 2015; 11(3): 193-199. 2Department of Material and Polymer Engineering, Faculty of Engineering, Hakim Sabzevari University, Sabzevar, I. R. Iran. 3Department of Mechanical Engineering, Shahrood University, Shahrood, I. R. Iran. In this paper, a systematic study on the effects of particle size and hybrid of two different size of silica nanoparticles on the toughening mechanisms of bisphenol-A epoxy was conducted. Nanosilica particles with mean diameter of 17 nm and 65 nm were blended into epoxy system. Probable synergy effects of these two nanoparticles on Young’s modulus and yield strength have been investigated. Results showed that the addition of the silica nanoparticles and also increasing content of nanoparticles improved Young’s modulus in all composites. In addition, the particle size did not show a considerable effect on the Young’s modulus and the use of both types of particles in a composite showed negligible synergy effect. On the other hands, results revealed that the addition of these nanoparticles did not change the yield stress of composites significantly. The fracture surfaces of composites were studied by Scanning electron microscopy. It was revealed that in all three series of nanocomposites, crack deflection, crack forking and debonding were the most important mechanisms.